I love the excess surrounding the holidays but come January, I’m ready for simpler surroundings. So while I revel in a clean slate (for awhile), I had fun going simple on my mantel. 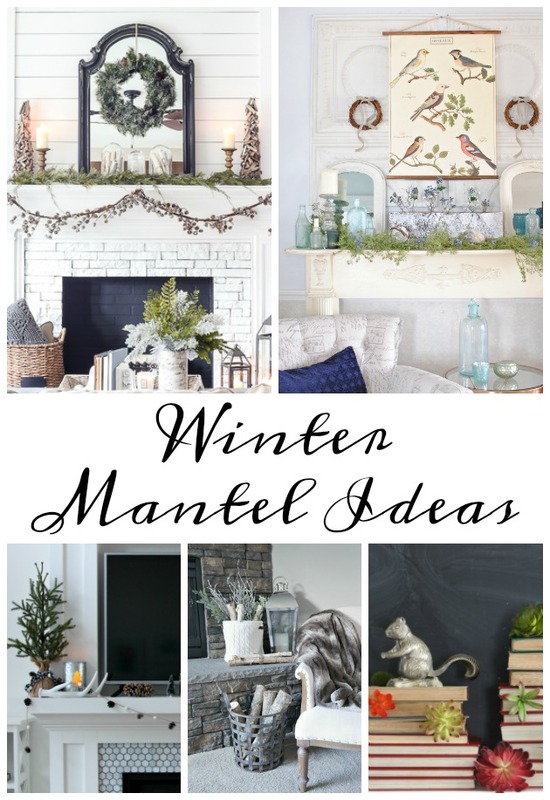 I’m teaming up with four fabulous friends who are sharing their winter mantels. You can hop from blog to blog to see them all. If you’re coming from Krista of Happy Housie, welcome. If not, make sure you don’t miss her bottle brush tree mantel. Every good decorating idea needs a start and I started with the idea of using my set of old red encyclopedias (found in my neighbors trash) and went from there. 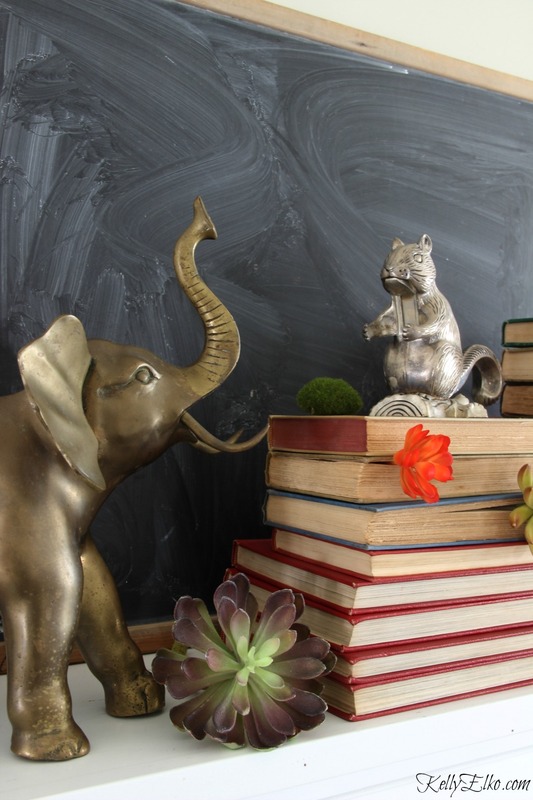 I added my thrift store brass elephant and thought it would be fun to use all of my animals so in came the squirrel nutcracker and brass quail. 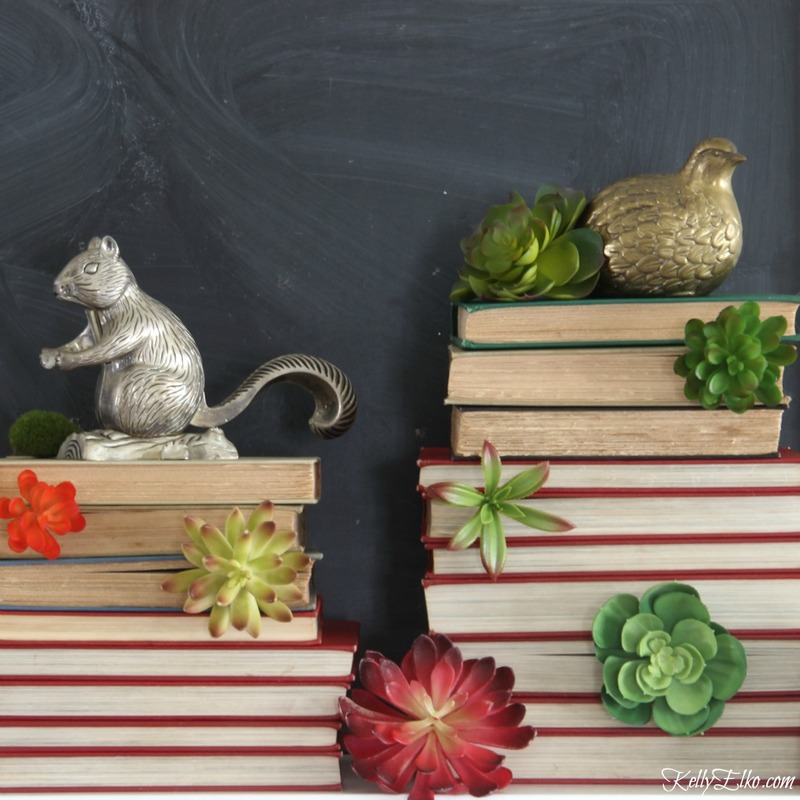 Faux succulents came next – don’t they look cute peeking out of the books like a vertical garden. Mine is a thrift store find but I love this replica of my vintage squirrel nutcracker. Decorating Tip: don’t forget the hearth when decorating the mantel. 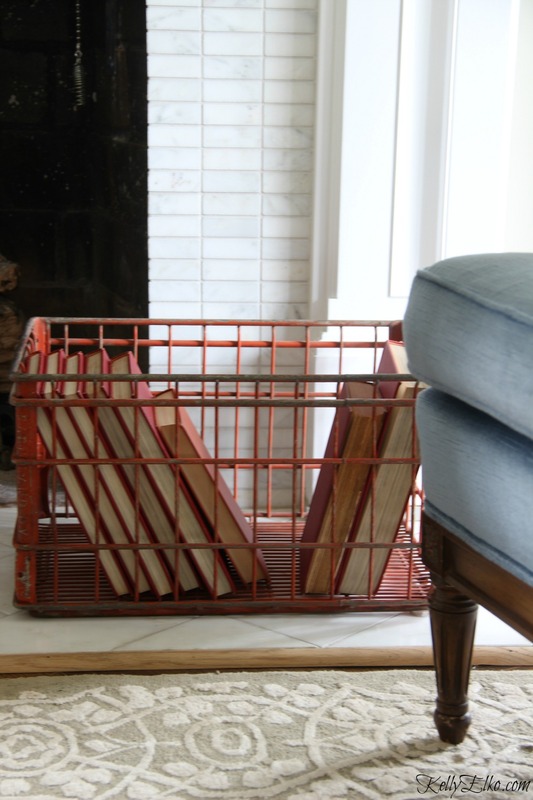 I carried the red down with an old crate filled with more encyclopedias. 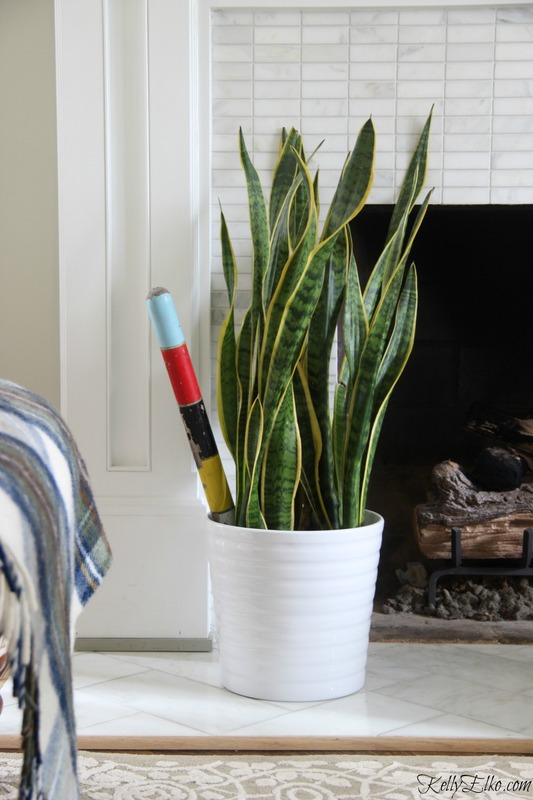 A snake plant balances the succulents. 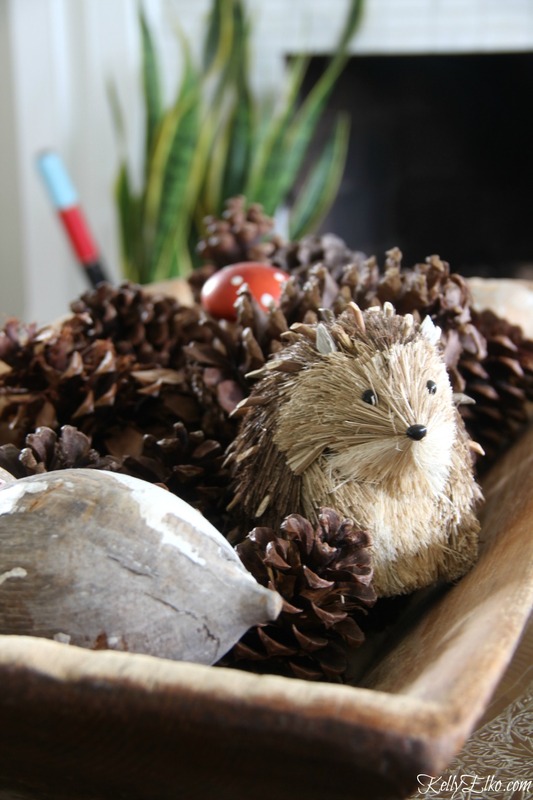 Another critter peeks out of an old dough bowl of pinecones on the coffee table. Instead of bringing back the same stuff you had in the house before Christmas, let’s look at our stuff in a new light and get creative. 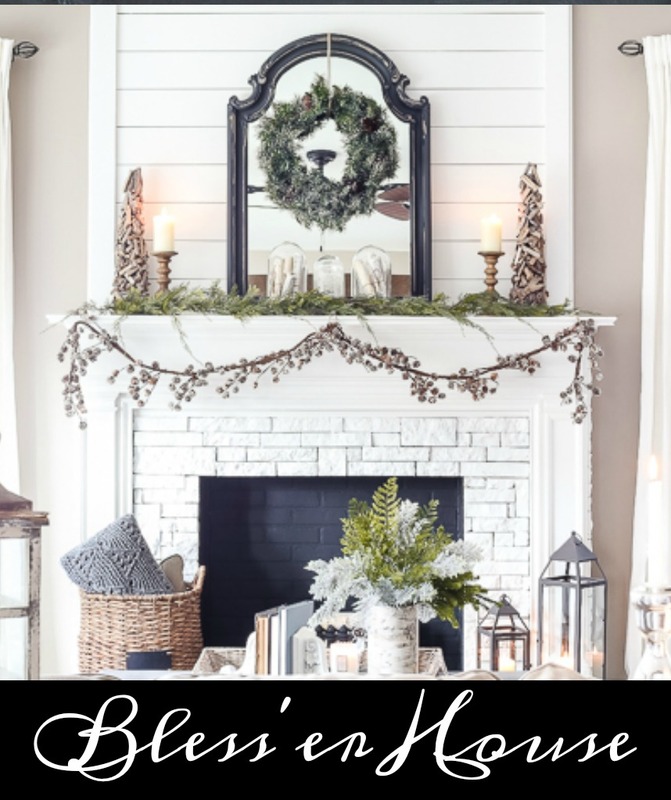 Head over to Lauren of Blesser House to see what she has up her winter mantel sleeve. P.S. 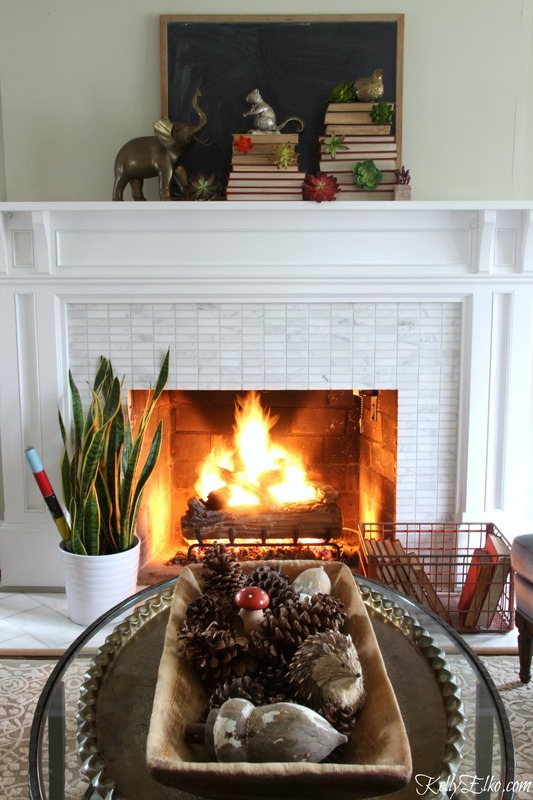 Don’t miss my winter mantel from last year HERE. so pretty! i love the cozy feel!!! i hope to get my own photographed today for a post tomorrow or next week… we’ll see what happens. this week was all thrown off with a sick child home. i was supposed to have FREEDOM! Kids really cramp our decorating style! Kelly, your mantel brings back a bit of nostalgia for me. My grandmother had that same brass quail in her home for many, many years! I instantly thought of her when I saw it on your mantel. LOVE the way you displayed the succulents. Such a clever idea. And I can’t believe your neighbor was throwing out those gorgeous, red encyclopedias. Lucky for you! Thanks so much Jennifer – can you believe I found that quail at an estate sale for $1! Sorry Pat – it’s working now and happy new year to you! So pretty. 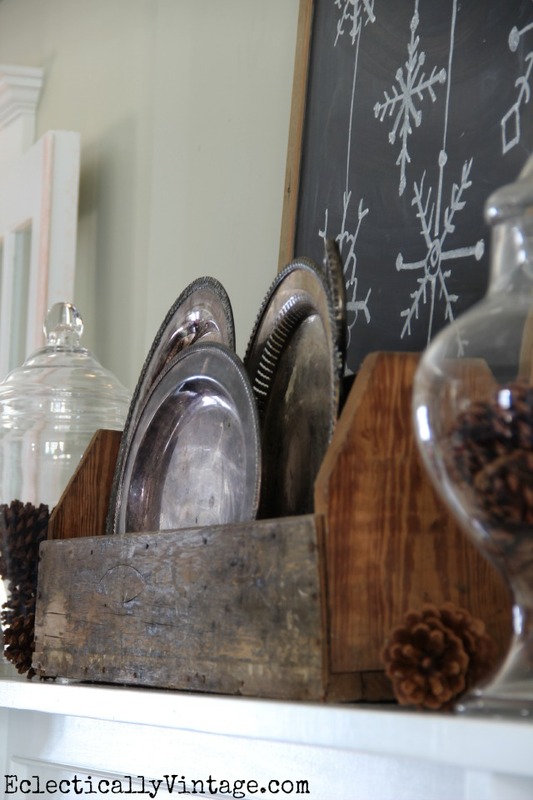 I have been clearing out everything from the holidays and playing around with my mantel the last day or two. So far, I just rested some black and white photos up there but I love your ideas…and there is nothing like a roaring fire this time of year! Mantels are always tough! I started with a couple of black and white photos of my dad and his schoolmates when he was a boy! Thanks Lauren from one book lover to another! Super cute and simple! Love it I still need to take down my christmas decor. Since we just moved into this house before the holidays, everywhere in my house is a clean slate. Which is super exciting to start fresh and have fun! Love the succulents in the books. Very exciting news and congrats on your new house! Enjoy decorating it! Gorgeous Kelly! Love the mantel styling but especially the colorful accent to your planter!! Thanks Stephanie – that stick in the plant is from an old croquet set! I’ve always loved putting away the red and green of Christmas and leaving the icy whites out for the winter in my decorating scheme. Makes me embrace the cold dreary Northeast winters (I do love boots in season though!). Kelly, do you have any New Year’s printables?….I love them for myself, but also rely on your nice seasonal printables to “talk” to my antique-shoppe-vendor-site browser’s, since I don’t work the store. It’s my way of interacting with potential customers without being there, and the other vendor’s look forward to your printable messages! I stick them all over the place, front door, cabinets, inside sites….and when they’re not there, everyone misses them! Thanks! I’m a boot girl too Allison! I don’t have any new year’s printables – I’m still recuperating from Christmas! I’m glad you and your customers love my printables – I’ll have to think about making some for 2018!! Super cute, Kelly! 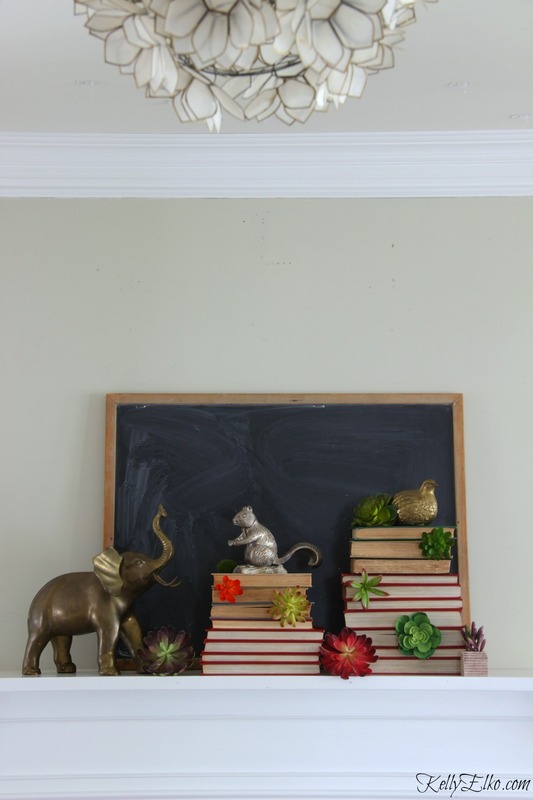 I LOVE the succulents peaking out – too adorable. Holding onto old encyclopedias is brilliant… I’ll need to be on the lookout for some! What a refreshing look! 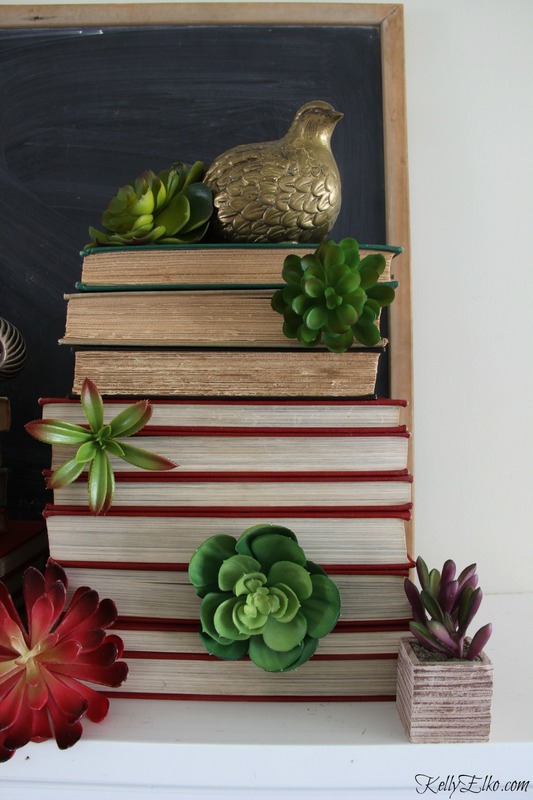 I love how you displayed the succulents in the books. I love it–perfect combination of items!